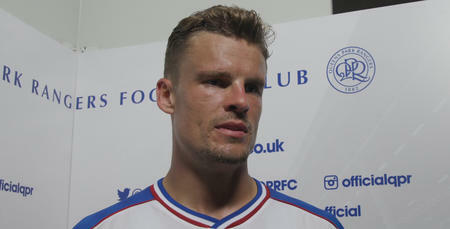 QPR striker Matt Smith was encouraged by the R’s performance in Monday night’s pre-season friendly against FC Union Berlin. Rangers lost a keenly-contested affair 2-1 in Germany, despite a positive performance from Ian Holloway’s side. Smith, who scored the R’s goal with a trademark header early in the second half, told www.qpr.co.uk he was pleased with a lot of aspects of QPR’s display. “I didn’t think we deserved to lose the game by any means,” he said. “I took us a little while for us to suss them out in the early exchanges, but once we did we were able to impose ourselves on the match and we created a lot of decent chances. 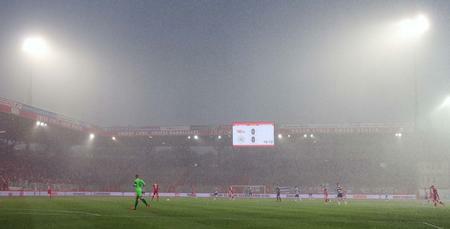 “We had the better of the opportunities throughout the 90 minutes. Smith’s headed goal was the undoubted highlight of the game, with the former Fulham front-man rising high to meet Yeni Ngbakoto’s pinpoint cross. “Scoring breeds confidence so that’s always nice,” he said, “one though it counts for little in pre-season. He added: “It was a well-worked goal. “A good build-up and a decent cross into the box from Yeni. I managed to get up ahead of the defender and head it home. “I’m in the team to provide a threat and feed off deliveries like that into the box. Next up for Rangers is a final pre-season friendly of the campaign against Premier League side AFC Bournemouth on Saturday, on a day when the club will commemorate the legendary Stan Bowles, who is suffering with Alzheimers. And ahead of what promises to be an emotional day for R’s fans in W12, Smith is excited to get back playing at Loftus Road. “We’re looking forward to getting back to our stadium,” he said. “We’ve done a lot of travelling in pre-season so we’re excited to be back playing at our home ground, which I can say a group of players we really enjoy playing at. Smith saved his final words for the R’s supporters who made the trip out to Germany, praising them for their support in the wake of Saturday’s postponement against Union Berlin owing to a waterlogged pitch. “I think those fans that travelled out here deserve a lot of credit,” he said. “The postponement was far from ideal for any of us, but for them it would’ve been a real nightmare. “Of course it was unavoidable but to see even a small amount of them here on Monday night, especially given the changes they’d have had to make to their travel plans, is huge credit to them all. The postponement was far from ideal for any of us, but for them it would’ve been a real nightmare.